If Robert Jordan, Glen Cook, and George R.R. Martin had ever written a fantasy book together, Chasers of the Wind would be it. The book is fun, engaging and action-packed, mixing assassins, massive world building, vile necromancers, and ancient mysteries to create a damn fine fantasy novel. I can’t recommend it enough for lovers of massive worlds and epic fantasy. As this tale begins, a reader is thrown into a centuries long conflict between the Empire and its neighbor, Nabator, as a simple soldier named Luk is caught up in a sudden attack on the Gates of Six Towers. However, while the attack itself is shocking since peace has reigned for years, what horrifies Luk is that among the Nabatorians soldiers walk the risen dead. Something that means only one thing: the Damned have returned to the Empire! You see, the Damned are the most feared and reviled people in history. Eight great Walkers (the Empire’s term for magic-users) who used their power to rise the desiccated flesh of the dead to do their bidding, and with this vile magic, they brought fire and death to the whole of the lands until their defeat sent them fleeing into the remote south beyond even Nabator. Ever since, the Damned have been the stuff of legend and myth; their names used to frighten small children into behaving. But no one thought they were real or that they would ever return to their old home, the Empire. So when the impregnable Gates of the Six Towers is breached and the enemy hordes unleashed upon the unsuspecting Empire, Luk’s fear of the Damned is so great that all he can do is flee into the wilderness, desperate to hide himself from the ancient evil. Not too far away from the gates, the tiny hamlet of Dog Green is utterly ignorant of the goings on in the rest of the world. That isn’t unusual nor bothersome to the simple people who live there. Actually, they like their peace and quiet, which is a good thing since – surrounded by forests and swamps – the few travelers who do pass through the town usually only do just that: pass through without ever stopping. So when four men show up in town looking for a man and a woman named Gray and Layen, it is out of the ordinary and raises a few eyebrows, but no one in Dog Green could ever have guessed why. For you see, more than six years ago in the far off city of Al’sgara beside the Oyster Sea, two Giijan, or master assassins if you will, did the impossible. These two – called Gray and Layen – assassinated an un-killable Walker (sorcerer). Someone so powerful – both magically and politically – that it rocked the foundations of power. Before these two could be found and punished, however, they were themselves murdered. A fire destroying their home and their bodies. Some few called the conflagration a clever subterfuge by the two Giijan. A way to conceal their obvious escape from Al’sgara. But no one – not even the practitioners of magic – could ever find any trace of them. So finally, people accepted that Gray and Layen had really been killed. Now, however, these four men show up in Dog Green, asking about the two infamous Giijan or any couples who only appeared in Dog Green during the last few years, and this eventually leads the strangers to a certain house on the edge of town. A place where the two, dead assassins ae found living a life of marital bliss, eager to not be pulled back into the underworld they left behind. Yet now Gray and Layen might not have a choice, because they discover that a huge sum has been placed upon their head, and they must either go back to Al’sgara and kill those hunting them or attempt to flee yet again. While Gray and Layen grapple with their discovery and their choices, the vanguard of the Nabatorian army reaches Dog Green. With the invaders covering the town and a necromancer sniffing out any magic users, there seems nothing left for Gray and Layen to do but sit back and wait it out – until one of the Damned enters the township looking for a powerful Walker (Empire’s name for magic users). A Walker that could only be Layen! From this beginning, Alexey Pehov crafts an epic fantasy that has it all. If you love world building, it is here. Evil villains with centuries old axes to grind? No problem, the Damned fit the bill. Clever assassins? Check. Empires clashing? There is a war going on here, even if it is in the background in this book. Unique, inventive races? Mr. Pehov has them in the story. How about a married couple who actually love and care about one another? Wow, it is here. And we must not forget the mysterious sorcerers of the world: the Walkers, whose society is only teased a bit but promises to be further delved into in the next book. Honestly, Mr. Pehov has included all the necessary elements to make this a page-turning epic in my opinion. With all that being said, there are a few issues with the novel. Nothing that unduly affected my enjoyment, but rather, things which other people have complained of. Allow me to explain. Mr. Pehov is Russian, so naturally, this novel was written in Russian and translated into English, which is the language I am reading it in. While I felt that the translator did an excellent job, there are sections of the book which seem a bit wordy or do not read smoothly. So keep that in mind. The book moves slowly. I would make the analogy of a heavy object rolling down a hill and gradually picking up speed until it is moving at warp speed by the bottom. To me that is how Chasers of the Wind reads. Mr. Pehov meticulously starts off the book setting up the story, introducing people and filling in lore. It reads slow, because there is so much foundation being laid. Once that is done, however, the story pace picks up until by the end of the novel things are moving along rapidly. At least, that was my feelings. 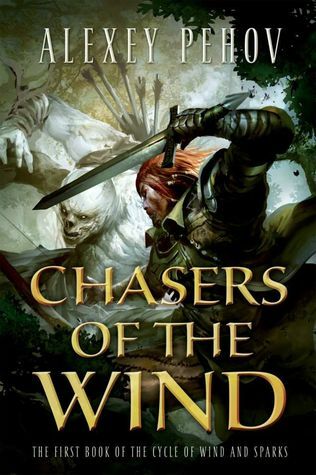 As I mentioned, I really enjoyed Chasers of the Wind and would recommend it to anyone who likes grand, sweeping epic fantasy that has lots of characters and plot lines going on. So if that is you, give this one a try. This entry was posted in Fantasy, High, Sword and Sorcery and tagged Alexey Pehov, best epic fantasy 2014, best epic fantasy series, Chasers of the Wind, epic fantasy series, The Cycle of Wind and Sparks. Bookmark the permalink. About two weeks ago I sent feedback to Tor apologizing for the fact that even though I’d requested and downloaded this, I wouldn’t be reading and reviewing it after all. It sounds awesome, but exactly NOT the type of story I’m craving right now, lol. If I’d read it I just would’ve ended up giving it a bad review, which it really doesn’t sound like it deserves. I’m probably going to be joining in the series at some point, though, it has wicked cover art. I hope to be reading this one soon. Wasn’t originally interested, but ended up with a review copy, and hey it’s getting some pretty damn good reviews. Sounds like it’s right up my alley. WHERE IS THE SEQUEL , BOOK 2 TO CHASERS OF THE WIND? Actually, that same question struck me the other day. Really, where is it? It should be coming out soon.